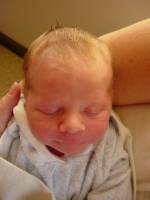 My very good friends Jim and his wife Nicole have a new baby: Ethan James Elliott - this blog is dedicated to them! I´ve known Jim and Nicole since I was working in Regina Saskatchewan as a consultant at Sasktel several years ago. We became Fast friends durning the 3 years I worked there and have stuck together ever since. Jim now runs http://www.darkfrenchhost.com and helps me out with web design work from time to time.